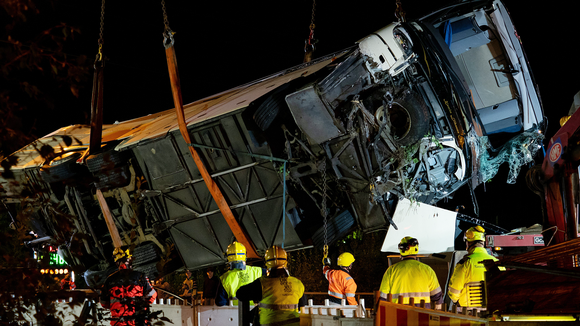 The Safety Investigation Authority retrieved the ill-fated bus from the Kuopio crash site on Friday night for detailed investigations. The driver in the bus crash that claimed four lives on Friday has told police that the vehicle’s brakes failed while it was climbing a ramp, causing him to lose control and ploughed through five cars before plunging off an overpass in Kuopio, eastern Finland. The bus landed on a train track below the roadway. On Saturday, eastern Finland police said that two of the four deceased were Swedish citizens, one was a Finnish national and another held dual Swedish-Finnish citizenship. Three of the victims were women and one was a man. In addition to the driver, 20 passengers were on board the bus at the time of the accident. Sakari Laurila, communications chief at the Safety Investigation Authority said on Saturday that in the organisations’ experience, it is unusual for accidents to result from failed brakes or other technical malfunctions. Laurila added that accidents are usually caused by a number of factors. “On a general level, braking problems are rarely the cause. We have not encountered that kind of thing in [our] investigations. Of course we will examine the role of brakes as a possible factor. At this stage it’s too early to say whether or not it played a role,” he commented. According to the agency, gathering all the facts relating to the case is likely to take weeks, however investigators hope to be able to wrap up their work in about six months. Officials resumed work on determining the cause of Friday’s fatal crash on Saturday morning. The bus was recovered from the crash site on Friday night for closer examination indoors. “The bus was relocated to a hall for a technical examination so that we can conduct a thorough investigation. The body and other remains will be carefully scanned,” Laurila explained. The safety agency communications head said that as far as possible, the organisation also hoped to interview eyewitnesses, officials and other parties involved in the accident over the course of the weekend. An examination of the crash site itself would also continue later on, but investigators are prioritising an examination of the bus and gathering evidence from witnesses. ”We will do quite a lot during this early phase and if necessary we will hear other parties later on. We are now trying to determine the cause, not assigning blame. Our investigations aim to prevent other similar accidents and to improve safety, so we can learn from these serious accidents,” Laurila noted. Friday’s bus crash was one of the most serious such accidents to occur in Finland in recent years. Four people died in the incident and 19 were injured when the ill-fated bus crashed through five private cars on the ramp before nose-diving on to a rail track. The incident occurred on the Levänen ramp on Highway 5 in Kuopio. Kuopio University Hospital said that three of the persons brought in for treatment were seriously injured, while six suffered less serious injuries and 10 were mildly hurt. The institution said that just one of the patients was from one of the cars that the bus had steamrolled. Meanwhile national rail carrier VR has announced that it has swapped some passenger train services for buses between Kuopio and Suonenjoki and between Kajaani and Kuopio. Commuters are being urged to prepare for delays. VR promised however that rail services between Kuopio and Suonenjoki would be back to normal from 8.00am Saturday morning. Edit: Updated at 4.07pm to include information about the nationality and gender of the deceased.